The excellent Mrs Peabody Investigates introduced me to the term respite crime, though my need for it pre-dated the name by many years. Happily during my current period of need one of Mrs P’s recommendations in this increasingly essential category became available from my library. It was indeed the perfect respite from both the real world and darker fictional offerings. It introduces us to Ashwin Chopra: a decorated and well-respected Inspector with the Mumbai police. As the book opens it is his last day at work. He is retiring early, and unwillingly, due to ill health. Before he goes he encounters a grieving woman who declares that her son’s death is being left uninvestigated because their family is poor. But even after he has fulfilled his last official duty Chopra can’t forget the woman and her young son. He tries to interest the man who replaced him but that proves fruitless so Chopra undertakes his own, private investigation. With help from old friends and a new one. 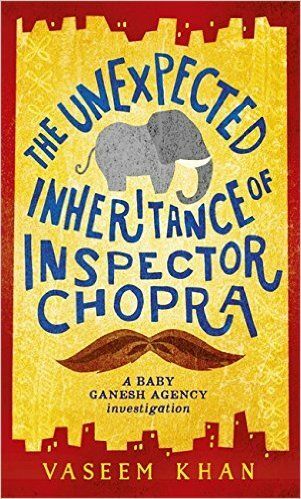 The new one is a baby elephant that Chopra inherits from a favoured uncle. Ganesh is “no ordinary elephant” according to Chopra’s uncle and this does prove to be the case. At first Ganesh – who is installed in the grounds of the apartment building in which Chopra and his wife Poppy live – appears to be pining for something and Chopra has to take a crash course in elephant care. But as the book progresses Ganesh proves to have skills that assist Chopra in very practical ways. I’m not normally a big fan of semi-anthropomorphised animal characters that do implausible (if not impossible) things. But Ganesh got under my skin with his particular mix of cuteness, melancholy and sixth sense. I don’t know if it’s despite the surreal elements – such as Chopra tailing a suspect through the streets of Mumbai with a 200kg elephant in tow – or because of them that the book does manage to have a realistic sensibility but I suspect it’s the former. It seems to me that Khan, who has lived and worked in India for long stretches of time, has captured the exciting chaos of Mumbai as it undergoes its transition from a traditional culture to a more modern one very well and that is partly due to the inclusion of oddball elements such as a sentient elephant. He juxtaposes the book’s lighter elements with depictions of the city’s poorer areas and the systemic corruption that pervades some segments of society so that the overall picture is accessible in a way that a wholly dark – or light – book would not be. There is real poignancy too with the relationship between Chopra and his wife and the way they individually deal with their unwanted childlessness. I thought perhaps things were stretched a bit too far when Poppy dreamed up her scheme to feign a pregnancy under her observant husband’s watchful eye but the resolution of this thread sat well enough that I found it easy to forgive this very minor flaw. I will definitely be continuing with this series and happily recommend it to those who like their crime fiction to have some lighter moments amidst the gritty realities. And I defy anyone not to be won over by the elephant. Thanks for the lovely mention, Bernadette, and I’m so glad you enjoyed the novel. It’s hard to pull this kind of crime novel off without tipping into the cloying and twee, and I agree that Khan does a really great job. Must seek out another dose of baby elephant soon. I’m currently reading Donna Tartt’s The Secret History, which is a long way from respite crime…! I’ve been hearing about this one, and I do like the name for the sort of book it is: respite crime. The setting is really appealing, too. All right, with two of you recommending this one, I’ll have to add it to my own wish list. I was a bit sniffy when my wife was twisting my arm to read this one, and in the end only did so to keep her quie . . . er, happy. But she was right: I loved it to pieces. Glad you did too. It’s odd how some descriptions or marketing can really do the opposite of what it’s trying to do. I think the Shamini Flint series is similar – it’s marketed as cute and funny but it’s also really insightful in the way it explores the different cultures and historical environments that the Inspector becomes involved with. I have heard very good things about this book and the series, and bought a copy about a year ago. I should actually read it soon. I did go over and read Mrs. Peabody’s post about Respite Crime, I don’t know how I missed it before. That is a very good phrase. This book sounds like my cup of tea for now, while dealing with the horrific insanity going on in Washington right now. Escapism needed! And while I have read two of Shamini Flint’s books, I will not be doing it for awhile. One book ends with the death penalty meted out to a character, and I do not find that at all entertaining.So, on hold for now. But this elephant book sounds like what I need. Another point: I’m hooked on Australian TV crime fiction shows. Watched “Winter,” with Rebecca Gibney, good. Now I and a neighbor are hooked on “Janet King,” and are waiting for season two to arrive on dvd. Why are Australian, British and Scandinavian TV mysteries so much better than those in the States? Don’t get it. Marta Dusseldorp is pretty unbeatable. Interesting thought Kathy. I know for myself one of the reasons I struggle with a lot of the American crime shows is guns. Perhaps a cliche but it just seems that every problem can be solved with a gun and half of the problems are caused by guns in the first place. In most other countries guns are just not as readily available so they don’t appear as devices so much in the fiction or TV. I do enjoy The Good Wife though – I never saw it when it aired here so have been watching it on streaming as it becomes available. Not many guns in that one. Rebecca Gibney is great…I didn’t watch Winter when it was on TV (I hate watching things on TV with all the advertisements so wait until they are on DVD or one of the streaming services) but have got my name down to borrow it on DVD from the library – it must be popular as it’s been ages since I put my name down. She had another crime show many years ago now called Halifax F.P. – she was a forensic psychiatrist. Yes, guns probably does have a lot to do with it. There is so much gun violence on TV and sadistic cops, serial killers, etc. I like logical mystery investigations and interesting characters, not gun violence and car chases. Maybe I live on the wrong continent. I”ll look for Halifax F.P. But have you seen Janet King with Marta Dusseldorp? She’s calm, cool and collected even when facing possible death. And smart! Wow. Oh, yes, this is a series which should be watched in order. Big events occur. Yes, drat. Why does that happen? No idea Kathy – happens to me too sometimes on other people’s blogs.